Using water efficiently to reduce unnecessary usage is the basic premise of water conservation.Indoor swimming facilities can conserve water, but more importantly, they can increase energy efficiencies and save money by using pool covers. 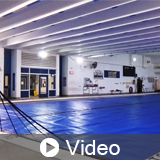 In this one-hour course, you will learn about different types of pool covers, deployment systems, and design considerations when specifying indoor pool cover systems. Evaporation of indoor pool water will be explained as well as chloramine control through proper water treatment and air exchange. Case studies will be reviewed to evaluate energy efficiency and explore cost savings while meeting code requirements and creating design solutions.